The sort of film I like: an intelligent historical drama. The Imitation Game tries to do a lot in telling the whole of Alan Turing’s life – the focus being on his time at Bletchley Park during World War Two, leading the team which would break the German Enigma code, but also narrating his awakening to his homosexuality as a misfit boy genius at boarding school, and his prosecution for indecency in the 1950s, contributing to his suicide in 1954. The film works well, capturing the difficulties of a misunderstood genius and the terrible days of WW2 for Britain as the Nazis bore down on them and the code-crackers felt the weight of the nation on them. I’d just finished watching lead actor Benedict Cumberbatch in a WW1 drama, the brilliant BBC mini-series Parade’s End, where he plays a different misunderstood genius. Imitation Game suffers by comparison; it is not the sequel-in-spirit I might have hoped for. It is a far less subtle and intelligent film, with less complexity of character. Parade’s End plays each scene perfectly, not needing to bring things to a crisis each time to achieve true drama. 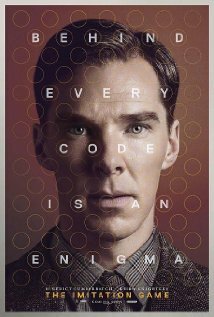 It’s unfair to mark Imitation Game down by comparison, but inevitably I do, as the Turing code-breaking machine is saved at the very last minute, and the small canvas requires all sorts of shortcuts. Keira Knightley plays the second lead, Joan Clarke, superbly. She almost never appears in anything less than a very good film, and this is no exception. (Although I will never watch King Arthur or Domino.) If this film tries to achieve too much in two hours, who can fault that?